Telegraf is part of the TICK Stack and is a plugin-driven server agent for collecting and reporting metrics. 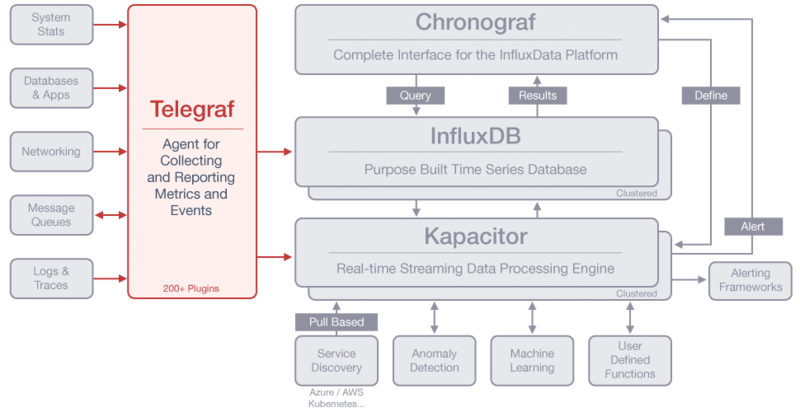 Telegraf has integrations to source a variety of metrics, events, and logs directly from the containers and systems it’s running on, pull metrics from third-party APIs, or even listen for metrics via a StatsD and Kafka consumer services. It also has output plugins to send metrics to a variety of other datastores, services, and message queues, including InfluxDB, Graphite, OpenTSDB, Datadog, Librato, Kafka, MQTT, NSQ, and many others. Connect to datasources like MongoDB, MySQL, Redis, and others to collect and send metrics. Collect metrics from your modern stack of cloud platforms, containers, and orchestrators. Collect critical stateful data (pressure levels, temp levels, etc.) from IoT sensors and devices. Telegraf is a metric collection daemon that can collect metrics from a wide array of inputs and write them into a wide array of outputs. It is plugin-driven for both collection and output of data so it is easily extendable. It is written in Go, which means that it is a compiled and standalone binary that can be executed on any system with no need for external dependencies, no npm, pip, gem, or other package management tools required. With over 200 plugins already written by subject matter experts on the data in the community, it is easy to start collecting metrics from your end-points. Even better, the ease of plugin development means you can build your own plugin to fit with your monitoring needs. You can even use Telegraf to parse the input data formats into metrics. These include: InfluxDB Line Protocol, JSON, Graphite, Value, Nagios, and Collectd. The Telegraf plugin architecture supports your processes and does not force you to change your workflows to work with the technology. Whether you need it to sit on the edge, or in a centralized manner, it just fits with your architecture instead of the other way around. Telegraf’s flexibility makes it an easy decision to implement.